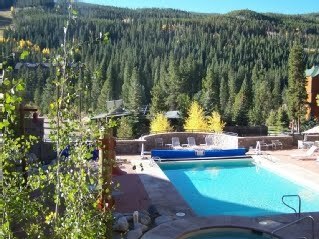 Our ski condos are located in Keystone's River Run village. The village's walking mall is the heart of Keystone and you have only a few steps to find Starbucks, restaurants, bars, shopping and of course the lifts to access the great family ski adventure that Keystone is famous for. Our two-bedroom unit is on the second floor of Dakota Lodge and has excellent mountain views from both bedrooms and the living room. Our condo has King beds in both bedrooms and an upgraded Queen sleeper in the living room. It sleeps six people in comfort. Our one bedroom condo in River Bank Lodge has stunning mountain and wetland views through the wall of windows in the living room. The Gondola and Summit Express lifts are an easy walk. The in-room spa is a great way for two to relax with a view of the mountains. Our unit has an upgraded king bed in the bedroom and an upgraded queen sleeper in the living room. This unit has a fully equipped galley kitchen. You can enjoy the beaver pond's frequent wildlife visitors from the comfort of an easy chair in the condo or from Riverbank Lodge's upper and lower deck. Children will delight in feeding the trout.